Hello and welcome to JT Hughes Honda in Shrewsbury. 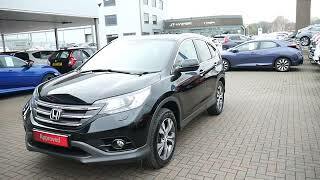 Today I'm going to show you around our used, very clean Honda CRV we now have for sale. Now, this is the SR spec finished off in the Crystal Black metallic paint and is a 62-plate with just over 51,000 miles on the clock. Starting around the rear, the SR does come with your rear integrated parking sensors, as well as the rear parking camera, located just above the registration plate. As you'd expect with the CRV, it's got a very large boot space with a spare wheel included. The SR spec does come with your silver roof rails, your privacy glass in the rear, and your 18-inch alloy wheels. The interior comprised of half leather, half cloth, electric windows all around. Warranty included with this vehicle will be 12 months, with the option to upgrade that for a further 12 months for the cost of £299. Towards the front of the vehicle, it does come with front parking sensors, fog lights, LED daytime running lights. You've got sensors and cameras up in the centre of the windscreen for your driving aids and your safety features. Flexible finance options are available on all our Honda Approved vehicles. And from the driver's side, it does come with a with multi-function steering wheel with cruise control, automatic wipers and auto headlights. And this is the 1.6 automatic with the automatic gearstick just there, FM and AM radio with a built-in CD player, a manual handbrake. And on the SR, it does come with heated seats. And there we have it, guys. Again, being a Honda Approved vehicle, service plans are available within the service department. If you've got any further questions at all or you'd like to book yourself a test drive, please give us a call here and as always, we'll be happy to help.